Here’s a dish that has been requested by a Lee Kum Kee fan! The glaze portion of this recipe would also be great on some chicken wings as well. 1. 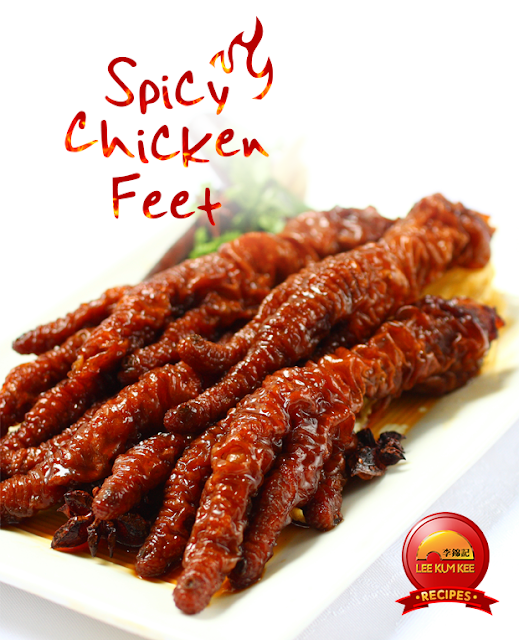 Wash the chicken feet and clip off the nails. Dry and rub with salt. 2. Let it stand for 10 minutes then rinse again in cold water. 3. Bring a large pot of water to boil. Place the feet in the pot, add salt and boil for 1 ½ hours until the feet are tender. 4. When done, drain well. 5. Place a pan over high heat. Put in cooking oil. Add the legs and sear to lightly brown. 6. Add the Lee Kum Kee Soy Sauce, Lee Kum Kee Hoisin Sauce, Panda Brand Oyster Sauce, sugar, chili, anise and cinnamon. Bring to a simmer. 7. Cook, covered for about 10 minutes. 8. Uncover and simmer until the dish is almost “dry” tossing frequently to coat the feet as the sauce reduces.